We are quickly approaching the start of my second year of homeschooling some of my kiddos. This year I will have a 6th grader, a 3rd grader and a preschooler. Last year I found a version of the workbox system that really worked for us and I wanted to share it along with the modifications I made to it. 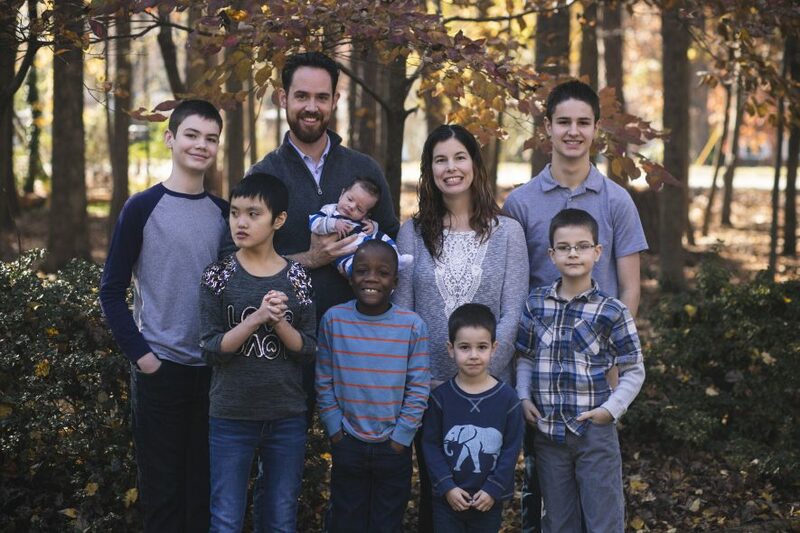 First, you need a file box for each child. This is one of my kid’s boxes. 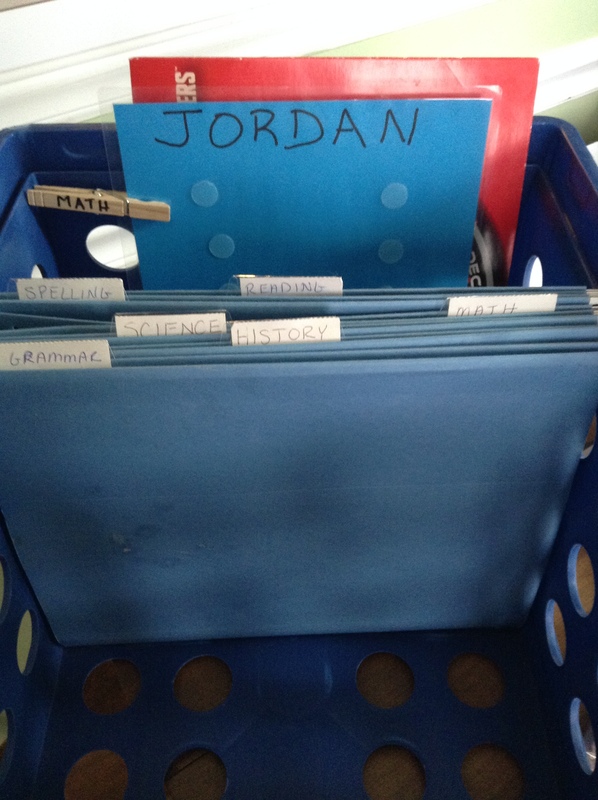 Then you need hanging file folders for each subject to be put in each child’s box. I try to color coordinate the folders and box if possible so that when the folders are not in the box I can tell whose they are. 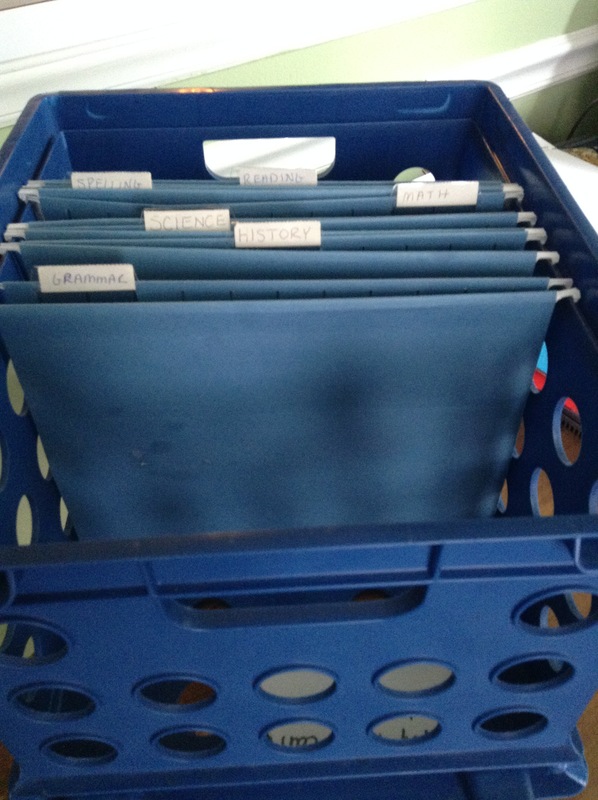 I label each folder for each subject that child will have for the year (Math, Science, History, etc.) Inside each folder you put the work for that subject for that day. At the back of each workbox I put one folder with pockets. This is for work that is completed to be turned in. Then I have a laminated sheet of paper with the child’s name at the top. This is the sheet where I can tell and the child can tell what subjects they need to do for the day and as they do them they can see what still needs to be completed. Last year we used velcro to affix the names of each subject to the sheet but it didn’t work that well, so we are using clothes pins this year with the subject written on the clothes pin itself. As you can see in this photo. I plan to make the sheet of paper a little smaller so it will fit in the workbox with the clothes pins more easily. 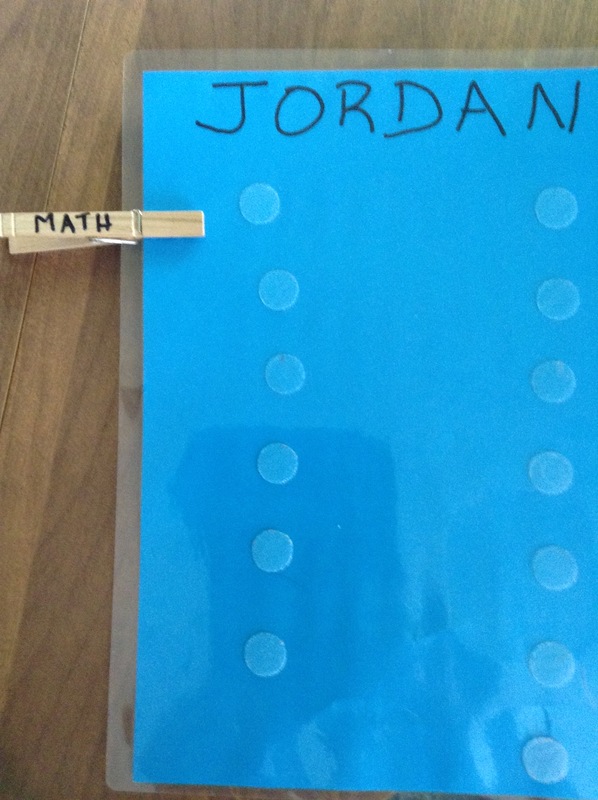 So, once the child completes the work for math for the day they would remove the “math” pin from the sheet and then I can tell and they can tell what they have yet to complete for that day. Okay, so how do I use this system? First I have a teachers plan book. As shown below. I write plans for each day for each child. I actually have already done the plans for each day all the way through December of this year. I do one semester at a time. I do this in pencil, so it can be changed if needed. Generally though, I try to stick with the plans so that I don’t have to rewrite all of it. It brings a level of accountability for me since I am too lazy to change the plan book. lol. 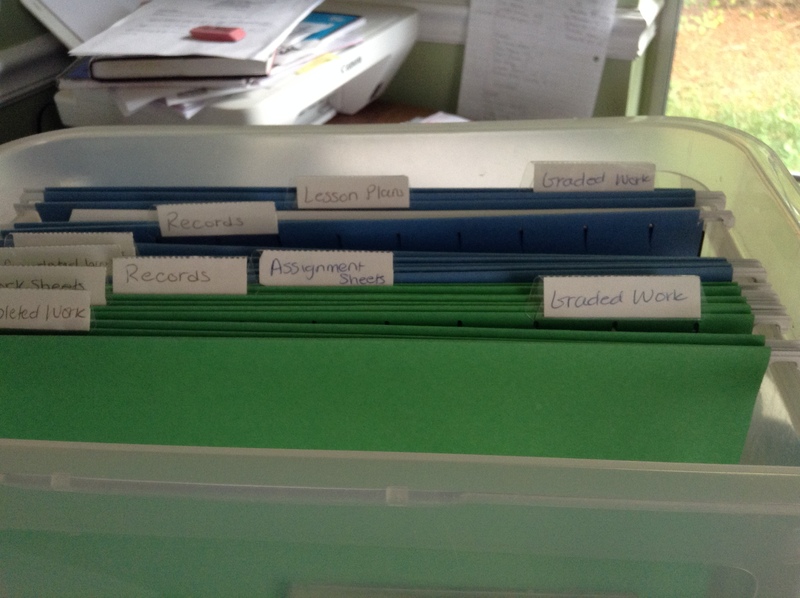 Then in each folder in the workbox there is an assignment sheet. Shown below. Forgive the sideways photo. I can’t figure out how to turn it on this new wordpress format. Computers are not my best skill. hahaha. Anyway, this is the assignment sheet which goes in each folder. This is the one for “spelling”. It’s made by cutting a sheet of paper in half and then writing the subject at the top, dividing it into five sections and writing the days of the week at the side. All that is done in permanent marker and then laminated. 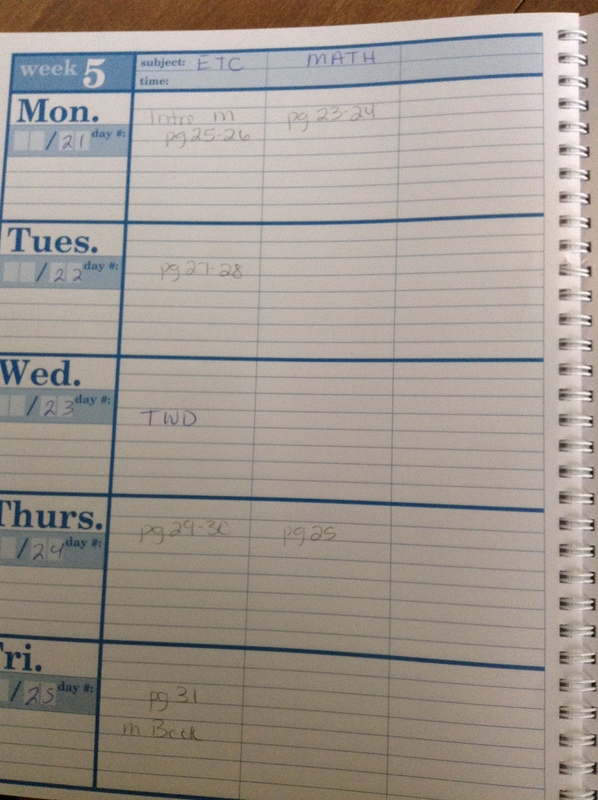 Then you use a Visa Vie marker to write in the assignment for each day of that week. The Visa Vie markers can then be washed off with water and reused. 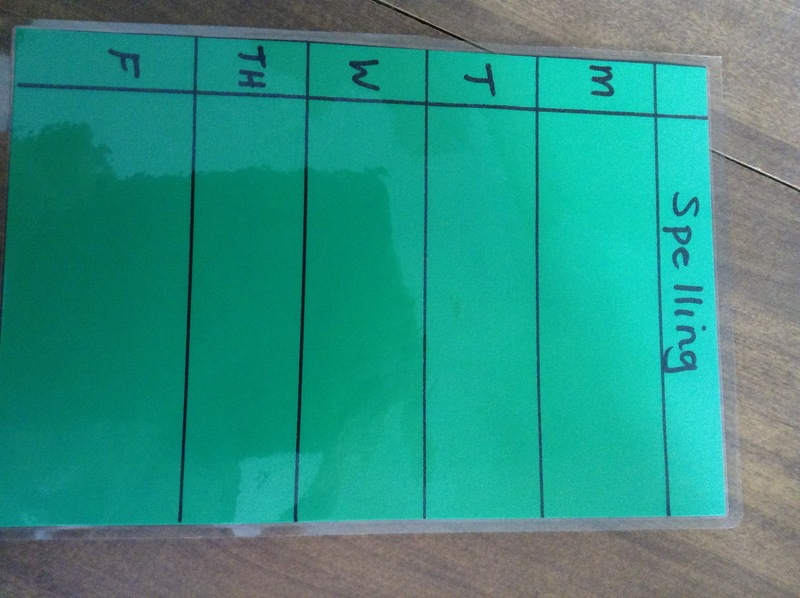 At the beginning of each week I take out my teacher’s planning book and look at what each child has to do for that week. Then I go to their workboxes and take out the assignment sheets from each folder. I then write down what that child has to do for that subject for that week and return the assignment sheets to the folder. Then I put the worksheets or workbooks they will need for that day in each folder. Then I clip the subjects they need to do that day to the sheet with their name on it and put it in their workbox. The child then looks at the sheet with their name on it and chooses the subject they want to do first and looks in the corresponding folder for the assignment sheet to find out what they need to do for that day. When they have completed that subject they remove the clip from the page with their name on it. They keep working until they have removed all the clips and completed all work. The completed work goes in the pocket folder at the back of their workbox. At the end of the day I remove the work from the folder and reload the hanging folders with the next days work. Then at the end of the week I take out assignment sheets and wash them. I then write the assignments for the next week and reload the box. I find it helpful to have two sets of assignment sheets for each child so that I don’t have to wash them each week. I also have a workbox for myself as shown below. So, that is our workbox system. I really like it because they kids can work independently on their work and they always know what they need to complete. It is easy to implement once you get it set up and it doesn’t take up a ton of space.